This has been written on my phone, so apologies for the lack of links etc. I may add a few bits and pieces in a few days time when I have internet access. The backlash to the end of grade inflation has continued. Politicians; newspapers of all stripes, and many different types of teacher have labelled it a crisis. Most have obvious agendas. Politicians need to score points. The media needs stories. 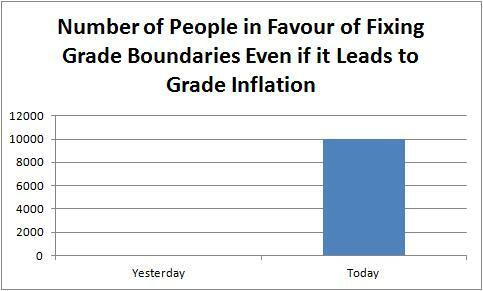 Teachers, particularly headteachers, need excuses now that grade inflation has ended and a bad year will look like a bad year. All want some excuse to say that there is a problem, without actually saying exams should get easier forever. The desperate hunt for an anomaly in the exam results (beyond the mere fact that this year grades didn’t go up) has focused on AQA English language GCSE. As I explained last time, this exam was about as dodgy as it could get. Thanks to a new style of exam where 60% was “controlled assessment” English departments were in a situation where it seemed there were few obstacles to getting kids to grade C and they were only prevented by a last minute movement of boundaries. Now a moment’s reflection would make one think: “hang on, does anyone really believe that almost two thirds of school leavers have a good standard of reading and writing is an underestimate?” It should be a source of national shame that English GCSE had reached that point (and let’s not forget English exams this time round included studying subjects as complex as celebrity interviews and reality TV) . But we have become so used to lowering the bar in English that when this time the standard was raised to a level of difficulty beyond anything we have seen since 2010, it came as an enormous blow to schools, particularly those who had manipulated their scores only to discover they hadn’t manipulated them far enough. 1) Controlled assessment boundaries moved between January and June. These were small moves, in fact if I have got this correct they were within the “tolerance” levels for controlled assessments (i.e. the amount schools can overmark by without anyone caring). However, these do mean that the same performance would be worth more in January than in June. Of course, the ridiculous situation where you can do the same assessment at different times of the year is a problem. However, once it’s been accepted we have to admit that once some students have done it for January, and it’s been marked, it is going to be a lot easier to do it in June. If you think that exams should peg grades to particular performances rather than to level of difficulty you might object. But if you do think that, then you are arguing for something that will inevitably result in grade inflation. It’s also worth adding that AQA had warned schools that these boundaries could move in the early years of a new course, although they didn’t specify that it could change between the January and June submission. 2) Grade boundaries on the formal exam went up by 10 marks. This is apparently shocking. How could two different exams have different grade boundaries? Well the clue is in the word “different”. This is not unprecedented; the example I keep hearing about on twitter is A-level maths exams which have had boundaries move by this sort of amount between January and June. There is no real ground for complaint here but going on about it has confused a lot of people who have assumed that it was the controlled assessments where the boundaries changed by 10 marks, rather than the rather more understandable situation of different exams having different grade boundaries. 3) The change occurred between January and June. I have covered above the way this has happened and why it is not cause for concern. However, one conspiracy theory has it that for such changes to occur then it must be the case that lots and lots of students must have got grade C in January and the only way AQA could stop grade inflation was to mark really harshly in June so that every excess grade C from January was compensated for by taking a grade C from students in June. 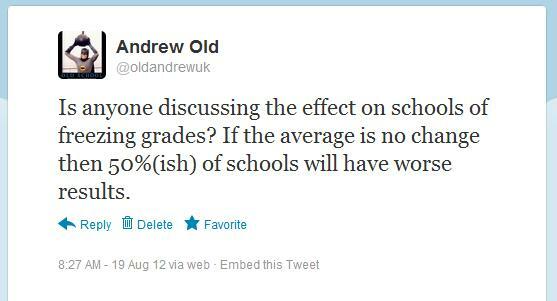 However, AQA have now said that 94% of controlled assessments were submitted in June. This is not the clearest statement about how many students submitted at different times (some could have submitted both times) but it would make it highly unlikely that there were so many grade Cs in January that students in June had to take a fall. It also means that even if there was insufficient rigour in the January exam, it would hardly justify replicating it in June to avoid disparity. 4) Politicisation. It is an inevitable fact that whenever anything changes in education, somebody complains that it is “political”. Nobody ever explains why that makes it wrong. Nobody ever explains why the status quo is politically neutral. Personally I want education to be political. I want people to argue about the principles involved; object to the injustices, and appeal to the public for support for their ideas. Removing politics from governance is an incoherent idea, and can only really be interpreted as removing democracy. 5) Won’t somebody please think of the children? I have lost count of how many appeals there have been to the suffering of students who have had to endure the ordeal of an exam slightly tougher than last year’s. Some have even implied that actually looking at the statistics to see what happened, rather than being outraged at the fate of any child who failed, shows my heartlessness. I am afraid that I have yet to find a reply to this argument which isn’t rude and angry, so I’ll save it for the comments if anyone needs it. A final point: it has now been claimed that thousands of (probably very able) students switched from English GCSE to English iGCSE this year. If true, and I have understood this correctly, then we are no longer talking about English exams that toughened enough to cause the 1.5% fall in GCSE English passes (before appeals). We are likely to be talking about an exam that, given the change in intake, was even closer to last year’s in terms of grades given than even the 1.5% figure suggests. Unless some new evidence turns up, this is still looking like a fuss about nothing; a complaint based on innumeracy, politics and a desperate effort to avoid responsibility for the scandal of dumbing-down. If you don’t support dumbing-down and grade inflation, and you don’t have some sensational new piee of evidence, then there really is no excuse to join in. I’ve heard it observed that any group with the word “truth” in the title is rarely interested in the truth. It’s not too hard to find examples, say, “9/11 Truth Movement” or “Holocaust Truth”. A similar phenomena occurs in education where organisations are often named after the very things they oppose in practice. So for instance, the “United Kingdom Literacy Association” campaigns against the most effective way of teaching reading. The “Campaign For Real Education” wants most kids to be in secondary moderns getting a second class education. The “National Association for the Teaching of English” opposes the explicit teaching of grammar. Even then it probably hasn’t got as bad as America where groups dedicated to worsening conditions for teachers have names like “StudentsFirst” or “The National Council on Teaching Quality”. That said, even I was shocked when yesterday I learned of a relatively new organisation in the maths world, National Numeracy. The organisation responded yesterday to the plans for a new national curriculum which emphasises basic numeracy, by complaining about “early instrumental methods and rote processes”. In the past they have also attacked an emphasis on “procedural tools like times table [sic]” Their website complains about “Boring ‘classroom maths’” which “for too many.. means merely ‘doing sums’ in a classroom” and indicates their approval for questioning “why 80% of ‘classroom maths’ concentrates on computation – which is the one area that those using maths in the real world ‘outsource’ to computers”. What actually shocked me was two things. Firstly, the sheer nerve they show in calling their organisation “National Numeracy”. In ordinary English “numeracy” tends to refer precisely to the ability to do basic numerical calculations. In fact it is very often used so as to distinguish it from the more abstract understandings and creative methods associated with mathematics. What’s more, the “National Numeracy Strategy” was a government initiative in the late 90s which emphasised mental calculation and rejected the use of calculators. How on earth can they possibly justify calling their anti-numeracy campaign “National Numeracy”? So to get their definition of numeracy they decided it meant “mathematical literacy” and then managed to look up a definition of “mathematical literacy” which completely fails to mention numeracy. The first part of the definition about having “to identify and understand the role that mathematics plays in the world” is, to me, most reminiscent of the episode of the Simpsons “Girls Just Want to Have Sums”. In that episode Lisa is forced to attend a maths class especially aimed at empowering girls where they have to discuss how numbers make them feel rather than actually having to work anything out. This is also reflected in their full response to the draft primary curriculum, which repeatedly mentions the teaching of “attitudes”. With this dodgy definition of “numeracy”, it is no wonder National Numeracy actually campaigns to minimise the teaching of basic number skills. However, with the name “National Numeracy” they will continue to be reported in the media as if they were in favour, rather than against, numeracy. Do Nationwide agree with National Numeracy that too much time is spent teaching children how to carry out calculations? Do Nationwide agree with National Numeracy that there is a danger of an over-emphasis on “procedural tools” like times tables? Do Nationwide agree with National Numeracy that it is a potential problem that the new national curriculum focuses on “early instrumental methods and rote processes” or that children “do sums in classrooms”? Does Nationwide agree with National Numeracy that, rather than emphasising the ability to carry out calculations with numbers, numeracy should be about such things as “identify[ing] and understand[ing] the role that mathematics plays in the world … and engag[ing] with mathematics in ways that meet the needs of that individual’s life as a constructive, concerned and reflective citizen”? I described here the argument that we are now in an era of unprecedented technological change, which means it is no longer worth learning knowledge rather than skills. Want to guess where it comes from? “Shift Happens”, maybe? Guy Claxton? A speech by Stephen Twigg? It actually comes from the original 1956 edition of Bloom’s “Taxonomy of Educational Objectives”. Next time somebody justifies dumbing-down by appealing to technological change as a feature of the 21st century, remember that they are using an argument that has been around since (at least) about the time of the invention of Tipp-ex. Of course, the difference between then and now is that then culture was indeed changing rapidly and unpredictably for the majority. A lot of NQTs don’t qualify. A lot of NQTs who do manage to qualify do so only after changing schools. The supply teacher circuit is full of people still trapped in their NQT year who, having left their first position, are hoping to get a long-term supply contract or a permanent job where they can qualify. Behaviour is the usual reason. The first year of teaching is tough, and some schools make it impossible. Too often those running schools would prefer to see a teacher go under than admit there is a problem with behaviour in the school, or that there are too many challenging classes on that teacher’s timetable. However, some go under because they’ve taken bad advice. Advice that means they will not be able to cope for as long as they believe it. I thought of this recently when I read this blogpost. If you are an NQT have a good look. If you believe this is true, and you are going anywhere that is remotely challenging, and you plan to actually teach your classes rather than just entertain them, then this will probably destroy you. If you haven’t worked out what’s wrong, then I will begin by referring to the key error. A description is given of a class who go from lesson to lesson sometimes behaving and sometimes misbehaving. In the ones where they misbehave the teacher is in a bad mood. He’s the one who shouts most often. This is not the case in the lessons where the children behave. There the teachers calmly ensure that the class know the rules. In one, where the class are greeted with a smile, they are given lots of freedom to work independently, and yet are still able to behave well. There you go, evidence if any were needed, that if you are nice your classes will behave and if you are nasty then they won’t. Bad behaviour is the result of the poor temperament of their teachers. Smile and it will all go well. Got it now? If not, let’s rewind a bit and consider the evidence. Where the class behaves well, the teachers don’t shout. Where the class behaves well, their teacher is happy to see them. Where the class behaves well, they are trusted to work independently. Where they behave badly, the teacher dreads seeing them. Where they behave badly, the teacher is angry. Where they behave badly, the teacher is known to shout at them. Is it clear now? There is a strong possibility – one might even think a staggering obvious inevitability – that behaving badly for a teacher has an effect on that teacher’s mood and disposition. To believe that causation is acting the other way (a mistake I have previously discussed here) is fatal. When you believe that behaviour results from your negative disposition you can create a cycle of personal destruction. A class will be unpleasant to you. You will become upset. You will blame yourself for becoming upset. You will focus on changing your behaviour not the class’s. They will see that you will not stand up for yourself, and your attempts to but a brave face on being mistreated will be seen as weakness. They will behave worse. Lesson by lesson it will get worse, and no matter how positive you are they will behave worse and hate you more. You will end up seeing how much punishment you can endure and blaming yourself when it gets to you. They will see how far they can take it, i.e. see how much harm they can do to you without you fighting back. And psychologically there is an equally destructive cycle going on. If you are unhappy and you blame yourself for being unhappy, rather than doing anything about the cause of the unhappiness, it will simply get worse. I make my lessons as interesting and interactive as I can – they take ages to plan – but nothing seems to work. My marking is always up to date, I always praise good behaviour and try to make them feel positive about themselves. I make sure I don’t do whole class explanations talking for more than 2 minutes as advised. I had a weak moment when I saw a note a student had left in my bag. I thought we had a good lesson, the students were starting to appreciate me but it said they wished I got raped and killed! No idea who it’s from and I know it’s not personal but it hurt my feelings. When your reaction to extreme abuse becomes a matter of blaming yourself for being upset by it, you are doomed as a teacher, as this NQT was, because trying to put on a brave face will not stop it; it will encourage it. Teachers who get upset about little things will struggle, but in the long term most effective teachers do care about the little things. Teachers who try not to get upset by the big things, and that example is a very big thing, give a clear signal that it will be a fascinating experiment to see how much it takes to upset them in front of the class. The story in that TES thread is the story of 100s, maybe 1000s of NQTs each year. Now, returning to that original blogpost, apart from encouraging a teacher-destroying mindset, not all the advice in that blogpost is bad. Some certainly has the wrong focus. While it is true that planning and organisation is key to survival, it is not because they will behave if you have ensure “they will enjoy what you have planned or that they have been shown the purpose of their learning beyond the classroom”. It is because you will teach better, and be less stressed, if you already know exactly what you are going to be doing, particularly what you are going to do about behaviour. Consistency and using the behaviour system are very important (but watch out for the two discipline systems and make sure your record-keeping is very good so that when you use sanctions that you can justify every decision). The “reprimand in private” advice would be perfect if you were teaching a class of 5, or if misbehaviour was virtually unknown in your school, but virtually impossible to implement in most schools and should be considered an ideal rather than a practical suggestion. “Praise in public” should be okay, but can backfire with some children in some classes. I did write a blogpost aimed at NQTs previously which includes advice on where to seek further help and advice. Remember that it does usually get better after Christmas and the ones who put on a brave face and claim to be coping are often the ones who drop out, and those who find it challenging at first are often the ones with the high standards who will persevere in the long term. Most of all, work out early on who are the liars and the charlatans in the behaviour field, and what level of mistreatment by mentors and SMT you are prepared to tolerate, so that in a worst case scenario you will know when to say “enough” and stand up for yourself. You are currently browsing the Scenes From The Battleground blog archives for August, 2012.